The artistic reconstruction by Andrew Spratt shows how the Knockinnon Castle may have looked around 1540 had it been completed. It is sometimes spelt Knockinnan or Cnocinnon. As you drive North after passing through Dunbeath, the dominant Hill of Lychrobbie is obvious to your left and it is on the lower slopes of this hill, that the remains of what was to be a great castle can still be seen. It is situated near Cnoc Heara farm about 300 ft above sea level and some 300 yards inland from the shore. The position guards the whole coast from Berriedale to Clyth and the Dunbeath and Latheronwheel Straths. A lay-by formed by an old part of the A99 provides a convenient parking spot and it was from here that the aspect of the castle has been taken looking NW for the reconstruction. 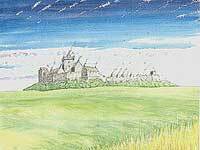 It is said that Knockinnon Castle was started by William, 2nd Earl of Caithness who fell at the battle of Flodden in 1513 and so it was never completed. It would have had the usual central thick-walled keep and a good number of stone built buildings to provide, stables, smiddy, chapel, brew houses, workshops, armoury, accommodation etc. There would have been an outer courtyard at the lower level to the NE of the site and this would have contained a number of dispensable timber buildings. A substantial wall of enceinte, rising from a cliff edge some 6 or 7 ft in places, would have surrounded the whole complex making it a formidable fortification indeed. Tradition also states that an earlier castle was built on this spot by Einer, when Caithness and Sutherland were still part of the Norwegian realm. Einar was the youngest son of Rogenwald “the mighty”. It is also suggested that the remains of an old parish school lie on a spur just to the South of the castle although other reports say that this may be the footings of a traditional crofting long-house. It is also believed locally that a church or chapel stood here at one time. So the keep your eyes peeled folks the next time you pass this spot, and with Andrew Spratt’s painting in your mind you will be able to visualise what might have been an impressive stronghold..